Select Menus → [name of the menu] → Add New Menu Item from the drop-down menu on the back-end of your Joomla! installation. 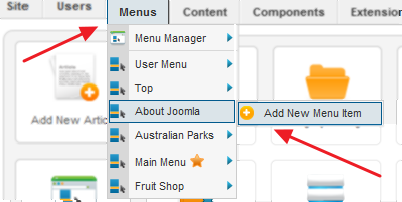 For example, if a Menu is called "About Joomla", select Menus → About Joomla → Add New Menu Item. To Edit a Menu Item: Select Menus → [name of the menu] from the drop-down menu on the back-end of your Joomla! installation. For example, if a Menu is called "Main Menu", select Menus → Main Menu. 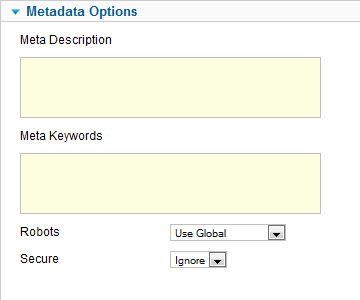 Then either click the title of the menu item or select the menu item and click the "Edit" icon in the toolbar. Menu items are the core structure of a Joomla website. Each Menu Item is a link to a webpage. 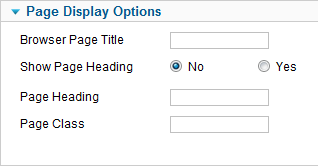 The Menu Item Type determines the type of page that will display when this menu choice is selected by the User. The core distribution of Joomla provides 29 different Menu Item types. If you install third-party extensions, these may add more menu types. The left side of the screen contains the Details section. This section is the same for all menu item types and has the following fields. Menu Item Type. 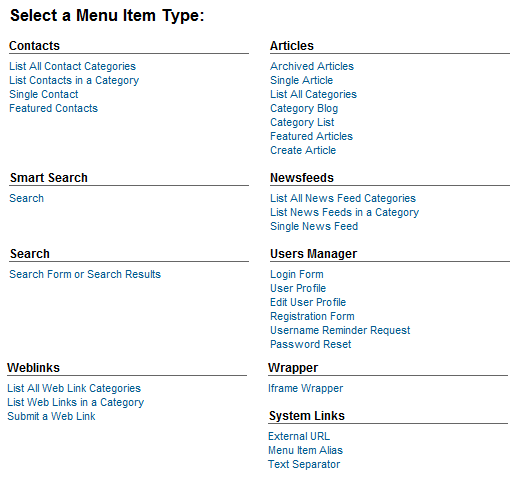 The first step when creating a menu item is to select the menu item type. Click the Select button to open a modal window that lists the available menu item types, as shown below. Click on the link for the desired type to select that type. Note that more types may be available if you install third-party components. When the menu item type is selected, the modal window will close and the Menu Item Type field is filled in automatically. When the screen redisplays, the available options on the right side of the screen will vary depending on which type is selected. The Details section, on the left, and the Link Type Options, Page Display Options, Metadata Options, and Module Assignment for this Menu Item, will show for all menu item types. Other options specific to the selected type may also be available. Robots. The instructions for web "robots" that browse to this page. Secure. Whether or not to use SSL and the Secure Site URL for this page. This part of the screen gives you access to a list of the site's modules as shown below. If you click on a module name, a modal window is opened with the same format as when you add or edit a module in Module Manager. 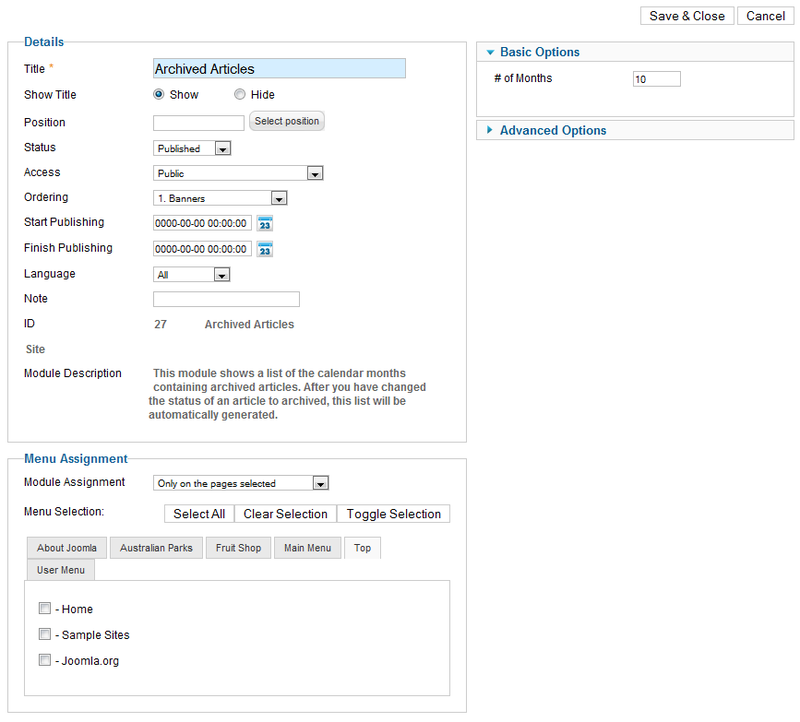 For example, clicking on Archived Articles opens a modal window as shown below. Using this modal window, you can assign the module to this or any other menu item and also enter the module's position and other options. The Display column indicates whether this module will display on this menu item. Note that this column is not updated until you save the menu item. The first thing you need to do from this screen is choose a Menu Item Type. To do this, click on the Select button and select one of the types. Then you can fill in the remaining fields as needed. There is a separate help screen for each different menu type. This page was last modified on 27 February 2013, at 07:23.